There's a union boss, a nuclear physicist, two company heads, a financial organization leader, an economist and the prime minister of Norway. Facebook COO Sheryl Sandberg during a panel session at the World Economic Forum in Davos, Switzerland. Nearly every year for the past three decades, heads of state, chief executives, top economists and other celebrities have swarmed Davos-Klosters, Switzerland, for the World Economic Forum's annual meeting, which kicks off again Monday. The Alpine gathering is billed as a place where the sharpest minds debate Earth's loftiest problems, including war and environmental decline. The themes have changed over time, but one trait has persisted: Davos is dominated by men. So much so that the political scientist Samuel P. Huntington's nickname for the global elite, coined in 2004 and still widely used, is "Davos Man." The 2018 cast of seven co-chairs comes as a twist. For the first time in the forum's history, all the top Davos Men are women. There's a union boss, a nuclear physicist, two company heads, a financial organization leader, an economist and the prime minister of Norway. The all-women leadership team presides over the conference after a weekend of women's rallies in the U.S. and around the world against the gender pay gap and other issues - and a year of fierce public debate about sexual harassment. The gender transformation at the top of the conference does little to improve its overall ratio. Just 21 per cent of the roughly 3,000 participants this year are women, the forum said. That's a slight uptick from 20 percent in 2017, 18 per cent in 2016 and 17 per cent in 2015. It's way up from 9 per cent in 2002. The imbalance is not specific to Davos. "That is a mirror of how this community looks like in the world at large," said Peter Vanham, a forum spokesman. Although female representation in the upper ranks of business and politics has grown in recent years - Iceland just made it illegal for companies to pay men more than women in the same jobs, and Canadian Prime Minister Justin Trudeau's cabinet is famously gender-equal - advocates say the number of women in power worldwide remains stubbornly low. Only 6.4 per cent of Fortune 500 chief executives, meanwhile, are women. They hold 26.4 per cent of executive and senior-level roles at S&P 500 companies, according to Catalyst, a firm that tracks gender data. They fill 21 per cent of board seats at such firms. And one-third of the business leaders at Davos this year came from countries outside the United States and Europe, where women typically occupy fewer leadership positions. One group at Davos, though, has achieved an even split: Of the 130 professionals under age 40 invited this year, half are women, Vanham said. Saadia Zahidi, head of the education, gender and work system initiative at the World Economic Forum, said the push for more equal representation is a slow climb. Organizers did not deliberately plan for an all-female leadership team at the 2018 conference, she said. Selections started this summer, before the Harvey Weinstein story broke and the #MeToo movement pushed gender disparities to the forefront. "All of the forum's employees can propose co-chairs, and we look for stakeholder balance in business, government, local society," Zahidi said. "As those nominations came through, there happened to be women in leading roles in each of these groups." Thus far, she added, the lack of men has triggered no backlash. "The longer term goal is to ensure that this should not be a surprise," Zahidi said. Barri Rafferty, chief executive atKetchum, the global public relations firm, said she has attended Davos four times since 2012 and noticed that one organization's "girls lounge" recently changed its name to "equality lounge." "People there just assumed I was someone's wife, and not there for my credentials," Rafferty said of the meeting. "I quickly corrected them." Sharan Burrow, general secretary of the International Trade Union Confederation, a global labor group with 176 million members, and one of this year's co-chairs, said that when she first started attending the meeting 20 years ago, it was full of men in suits - "a corporate jamboree." "There were so few of us women, we were almost like an afterthought," she said. This year, Burrow said, Davos will spotlight gender discrimination. 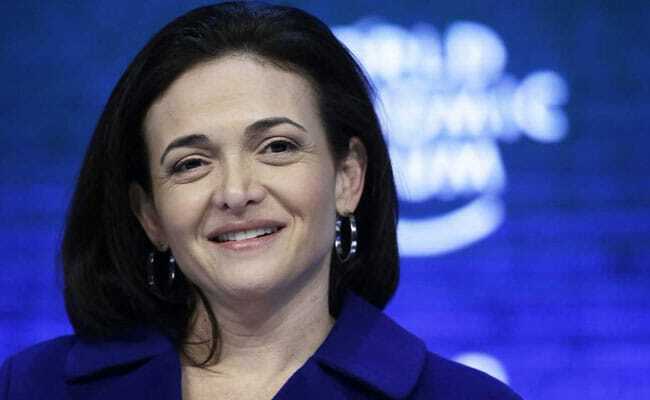 Sheryl Sandberg, the Silicon Valley executive who coaches women to be more assertive in the office, will co-host a Facebook event about harnessing technology to promote equality. Iris Bohnet, director of the Women and Public Policy Program at Harvard University, will lead a discussion about the history of gender roles and myths that hold both sexes back. Malala Yousafzai, the Pakistani activist who was shot in the head as a schoolgirl by the Taliban, will speak about her battle to expand access to education for girls and women. CNBC anchor Hadley Gamble will ask a panel of Saudi officials, including the ministers of commerce and economy, about the nation's plans to advance women's rights. The week in the mountain resort town will also feature three events on stopping sexual harassment - another Davos first. More than a dozen business, political and education leaders will participate, including Peggy Johnson, executive vice president of business development at Microsoft; Maryam Monsef, Canada's minister of status of women; and Brian Schmidt, vice chancellor of the Australian National University. "This is a major issue to solve if we are serious about stabilizing the future of our workplaces," said Burrow, the co-chair. "People are still defending behavior in 2018 that, frankly, as a very young feminist in the '70s, I thought would have been legislated out of existence."